Vladimir Chuprov, spoke with «7x7» about the Year of the Ecology in the Barents Region, the need for energy reforms and how Russia is building international cooperation in the Arctic. — Experts note that situation with environmental protection in the country in the Year of Ecology has become worse. Your opinion on this matter? — This is not the first year of ecology. The first year of ecology was 2013. In 2017, it became not only the Year of Ecology, but also the Year of Specially Protected Natural Areas. But in fact, 2013 and 2017 did not differ. In general, since the beginning of the 2000s, when Vladimir Putin came to the presidency, there has been a gradual degradation of the ecological system: on the levels of state, social and public. The year 2017 did not slow down this degradation process. The only thing is that there was more rhetoric: who travels by plane, learned that we have a Year of Ecology and protected areas and that in Russia there are 180 reserves to be opened for tourism. I would add for myself that also for gold mining and privatization. In relation to the privatization of specially protected natural areas — in 2017, another attack took place, by our count, the ninth in recent years, when they tried to introduce further amendments that opened loopholes for privatization or building of reserves and national parks. The places are reserved, many people want to build a bathhouse here. Another bad story — the gas attacks in the Moscow region from unknown sources. Muscovites felt as Chelyabinsk, Norilsk, Vorkuta residents feel when they have to breathe something awful. I just came from a meeting of the Moscow City Duma, and initiative groups spoke on this issue at a round table. I’ve heard everything except swear words. People are driven crazy. This is a scandal, I would note especially. Classical forest problems remained: fires, constant felling, underfunding of reforestation and forest protection. Nothing new. But good news for the Arctic. There is an understanding that it is impossible to live like this anymore: the delivery of goods across the Arctic («severny zavoz») with its «golden» diesel and coal and dilapidated barracks from the Gulag era became the object of attention of our politicians. Here I would mention two events. Rogozin with his statement, made back in 2016 [at a meeting of the State Commission for the development of the Arctic, Deputy Prime Minister Dmitry Rogozin proposed to actively develop alternative energy and energy-saving technologies in the north]. And just recently the issue of support of renewable energy in isolated power systems came under the control of Yuri Trutnev. Considering our Russian speed, only the ramp-up will take five to seven years. We hope that by the end of the next presidential term, some funding for such a replacement [diesel generation for renewable energy] will begin. All this takes place against the backdrop of positive oil price dynamics. This is both a plus and a minus. Plus, because some holes in the federal budget, for example, payment of pensions, will be closed, but on the other side, it strongly demotivates officials who seem to just get a motivation for switching to energy-saving technologies. Gold reserves are growing, and it seems to me that the officials have euphoria again, a feeling that we have survived the crisis. This is another negative, which, unfortunately, we received in 2017. An important motivation for changes in energy left. Gold reserves are growing, and it seems to me that the officials have euphoria again, a feeling that we have survived the crisis. What President Putin will bring for another term and whether the reforms will take place — it is a question. I am now talking about ecology and energy in the first place. And while we do not see any breakthroughs here. Well, in the Arctic, the government began to agree that it is necessary to «ecologize» energy. On the other hand, companies were subsidized in the extraction and export of oil and gas, and they continue. So, the rate on the raw material model of the economy remains. A similar situation with oil consumption in transport — there is a great potential for reducing the consumption of petroleum products. It was possible to modernize the transport system, for example, in Arkhangelsk before the international forum «The Arctic: Territory of Dialogue», which was held in March 2017 with the participation of the presidents of the Arctic states, including the Russian one. In Arkhangelsk, as in many provincial cities, the basis of public transport are polluting minibuses with emission levels clearly below Euro-5. It is not good for breathing. Where there previously were trolleybuses or regular public transport, everything is now often destroyed. It would be possible for the World Cup, which will be held in Russia in 2018, to make a breakthrough in the ecologization of urban transport at least in the host cities. But there is not much to boast of. In the forestry sector, a good example of a raw material model is the scandal with the possible felling of the Dvinsko-Pinegsky forest [located in the Arkhangelsk region between the rivers of the Northern Dvina and Pinega, considered to be the largest spruce forest in Europe], which Greenpeace Russia tries to protect from fellings and to give this territory protection status. Complex negotiations are underway: the Arkhangelsk authorities are swinging from one position to another. Forest industry, as well as the oil industry, has a very miserable choice: to quietly stagnate, because cheap and affordable resources are coming to an end, or to start moving, slowly but moving, towards a new model of the economy. Yes, it will require money, as modernization requires money, initial capital is needed to develop new technologies. But we can not live like this anymore. In the 21st century, coal and oil will not be an economic mainstream. Just a few days ago, the World Bank announced that it stops investing in oil and gas. The Bank refused to invest in coal even earlier. Some exceptions remain, but this is a serious signal to the entire business community. And business actively withdraws capital from fossil energy. In this situation, Russia needs to do something with our raw material model of the economy. But instead we see only patches like «let’s give more benefits to the oil industry workers, we will get more petrodollars and modernize.» Experience says that we are not modernizing. In the 2000s there was money, but no modernization. The reason was simple: a monopoly in energy generates a monopolized economy that leads to a monopolized policy. As a result, any such system is doomed to stagnation without a chance to move to a new model. In this situation, in the energy sector, for example, we will never be able to switch to renewable energy without serious reforms. Now oil companies are knocking out the next benefits. For example, another governmental decision is being prepared that the burning of associated petroleum gas on the Arctic shelf should be free of payments: now these payments come with an increasing coefficient of 25, but will be with a decreasing coefficient of 0.25 — so, it is suggested to reduce payments by a hundred times! The budget will not get the significant sums that «Prirazlomnaya» [an ice-resistant oil platform designed to develop the «Prirazlomnoye» field in the Pechora Sea] now pays for burning associated gas. The gains will ultimately go to the development of new oil and gas. — Are you talking about the federal budget? — Yes, the federal budget is prime bearer of the losses. But the losses of the federal budget from the distribution of benefits to the oil and gas industry affect the regional budgets. The system is such that regional budgets often survive due to point injections from the federal budget. Now [the head of the Komi Republic Sergey] Gaplikov is trying to keep parts of the tax on mining in order to close the gap in the republic’s budget — a deficit of about 10 billion rubles. For the republic it is a lot. But this is also a smart decision. Well, you got it now — and what to do a year later, or two? You will run out of oil — who will pay? There is no system exit, everyone is clinging to decisions that worked in the Soviet raw-material model, and they will not necessarily work in the 21st century. What caused this systemic hopelessness? Perhaps the answer is that today there is no trust in the triangle relation between business, power and population», there is no national unifying idea. The Germans said: «We will ressurect East Germany.» And they did. The Japanese said: «After Fukushima, we will do everything differently, we will not have nuclear power.» And they are now at all times developing solar energy. There was some public consensus. It is still impossible here, because everyone knows that whatever the authorities have promised, no matter what golden mountains — they will still be deceived or stolen. And business, by the way, often knows that the authorities will deceive, and the green and simple resident understands that there is no one to trust. You will run out of oil — who will pay? There is no system exit, everyone is clinging to decisions that worked in the Soviet raw-material model. — What trouble spots would you name in the Arctic and Barents regions? — Let’s divide the question. There are risk zones (with potential problems) and there are zones with existing problems. The platform «Prirazlomnaya» is located in the risk zone, and we will start with it. Every day, every second an oil spill can occur. It will be a powerful image blow to the oil industry, to all its Arctic plans. From which, by the way, Canada, in part Greenland (Denmark) and the United States refuse or have already refused. We and Norway are left. But Norwegians do not even have ice, and we have everything [oil reserves] — under meter of ice. The second risk zone is related to what was buried near Novaya Zemlya in the form of sunken reactors. Including the reactors of two submarines, at least one of which may begin to leak. It is necessary to do something, but there is no money. It can lead to a mini Fukushima. How much and where — it’s difficult to predict. Existing trouble spots. First, these are the last sites of intact forests, not only in Arkhangelsk, but also in Komi, and in Karelia. These important forests from the point of view of biodiversity are abandoned due to fires and constant felling. Oil spills are another enduring problem. This is what has been happening in Usinsky, Sosnogorsky and other districts of Komi for decades. And this problem is not only ecological but also social. — In 2017, are there more environmental activists and residents who protest against oil spills, in your opinion? — Their number has not decreased at least, in short. Moreover, there is a trend towards revitalization, and sometimes radicalization. I see it on the example of Komi, where villages have long been protesting against oil spills. Indigenous peoples are starting to raise their voice. Recently, activist reindeer herders held a sit-down in Yamal, invited officials and simple fellow herders to their chum [tent] for a heart-to-heart talk. Interesting form: not flash mob, not rally. This chum will travel through the Yamal tundra. A perfect example of activation, taking into account the local culture. Pickets and leaflets are not needed here. Why do they need a picket in the tundra? There is even no place to stick the leaflets. The story of Kechimov continues [the keeper of the Imlor lake sacred to Khanty in Khanty-Mansiysk Autonomous District]. The shaman became a blogger and online tells what happens to the sacred lake, which he protects from oil workers. In Murmansk, people protest against a coal terminal in the middle of Murmansk, the dust of which makes the windowsills black and creates risks for the health of the Murmansk residents. But we must not only talk about ordinary people. In the triangle «business-power-population» business is different, and the population is different, and the authorities also behave differently. Business remained the same, but became probably not so impudent in environmental matters. Over the past five to seven years, it has been possible to convey a simple idea to business and government: you can not treat people and nature with neglect. Therefore, there are some changes, for example, the state attempts to organize a system of separate collection of garbage. Authorities often listen to public opinion, as it happened with the restoration of the Ministry of Natural Resources of Komi. The last attack on the reserves already looks like an anachronism. I would have proposed the following idea here. In society, there are two (often multidirectional) vectors of interests or development goals. The first is state interest, the second is the interests of ordinary citizens. In this sense, the Barents region is unique as there is a huge gap between these two interests. The state says: «This belongs to us: fish, oil, the Arctic shelf, let’s be proud of it.» But when people see oil in the water and breathe coal dust, it is difficult for them to understand what is the state interest if it is realized at the expense of their health. When people see oil in the water and breathe coal dust, it is difficult for them to understand what is the state interest if it is realized at the expense of their health. — How do colleagues from other countries assess the ecological situation in the Barents Region? — There are such assessments, of course, and they are different. It is very important who exactly evaluates. If the government of Finland, this is one thing. If a public organization in Norway — another. We recently met with the Finnish presidential administration. It seems that for them Russia is a big, unstable, slightly dangerous or, rather, unpredictable, country. I can say that the leadership of Finland is trying to understand the leadership of Russia. Because of sanctions, everything is very politicized and it is difficult to hear each other. But I think that in general the Scandinavians are ready for dialogue. If we talk about ordinary people, the Scandinavian society is different from Russian. For them, for example, there is no concept of unfreedom. They are not afraid to criticize power, there is a completely different mentality. In Norway, last year, public organizations sued the government and challenged the discovery of new oil fields in the Norwegian sector of the Barents Sea, referring to the Norwegian Constitution, which states that Norway has obligations to future generations. — A lawsuit is in court, as far as I know. — It is in court. The decision will be ready soon, according to recent data — in January 2018 [4th January, and the public organizations lost]. The suit was adopted, the hearing took place, now the court took a time-out. And this is the regime in which the Norwegian society lives. The Russian public has a completely different mentality. We would have to convince the authorities and the companies that pouring oil in millions of tons is bad. And they are thinking how to switch to electric cars, renewable energy, so that they can not leave themselves offended, and help others. Here is the level of their tasks. And the tasks are set until 2050. In our country, tasks are measured in months. Planning horizon is a year maximum. In our North the planning horizon is even shorter — the summer season, when it is time to reclaim the oil spill, make the Arctic develivery of goods (Severny zavoz) , repair the pipes before the heating season. That’s all. Brought coal into the Arctic, survived the winter — thank goodness. — What international events in the Arctic region would you mark as important? — In the Arctic region, international news number one in the outgoing 2017 is the signing on November 30 of an agreement about a moratorium on uncontrolled fishery on the high seas, outside the exclusive economic zones of the Arctic five [Russia, the US, Canada, Norway and Denmark] around the North Pole. Very positive news. This is the next step to ensure that the territory is free of nuclear weapons, military presence, fishing, traffic of dangerous goods, such as oil. It is good that all negotiators, including non-Arctic countries such as China, which has the right to fish in this area, agreed. — In the Russian official information field there are mainly news about the opening of new military bases, militarization, defending part of the Arctic territory. — Yes, there is dissonance. Putin, on the one hand, made it clear that the Arctic is a territory for dialogue, [the Exxon company] is invited to participate in oil and gas projects in the Russian part of the Arctic shelf. On the other hand, there is a militarization. It is a fact. How can I explain this? Only theoretical assumptions can be made. There are two stories. One for the West on cooperation. The other is for the military-industrial complex and lobbyist groups, which need to get a budget for military programs (I suppose that this is not only in Russia), to protect against military invasion. The Arctic military race is expensive. Expensive for both the budget and the environment. There are new bases — it means there is a conflict between a person and a polar bear, poaching appears. It is almost impossible to control poaching. To exclude this, it is necessary to simply choose between the Arctic — the territory of dialogue and cooperation — and the Arctic — the arena of military confrontation. Our choice, of course, is in favor of the first one. The Arctic military race is expensive. Expensive for both the budget and the environment. — In your opinion, what were the important changes in environmental legislation in 2017? — We do not take the regional level, because, in principle, the entire legislative culture in relation to the Arctic is formed at the federal level. And here first of all it is necessary to talk about attempts to weaken the environmental legislation. I said about the privatization of reserves and national parks and the reduction of environmental standards for the oil industry. In addition, in 2017 it succeeded in discouraging attempts to permit the extraction of common minerals in the floodplains of streams and rivers. We not only beat off attempts of de-ecologizing the legislation, but we are trying to strengthen what exists. In the outgoing year, we made an attempt to stir up the government with a view to prohibiting, at the federal level, heavy all-terrain vehicles in the tundra during the snowless period [all-terrain vehicles destroy the vegetation cover of the tundra]. We found support in the regions. In Komi, where they wanted to cancel such a regional ban, they agreed with our arguments and did not cancel it. Alternative transport for the tundra is pneumatics and not only. Experts of Greenpeace Russia prepared a draft of a federal law. But in the end there is no movement. We hope that in 2018 the Ministry of Natural Resources will pay attention to this issue. We tried to initiate a complete ban for single-hull tankers in the Arctic. Such vessels are the most dangerous, since if a vessel have a hole, oil immediately enters the water. There is a ban, but there are a lot of exceptions, which we proposed to close. They can not do it! Summarizing, we can say that we can only stop the degradation of legislation, but the proposals for improving it are damped or simply ignored. — And what about the Arctic law? 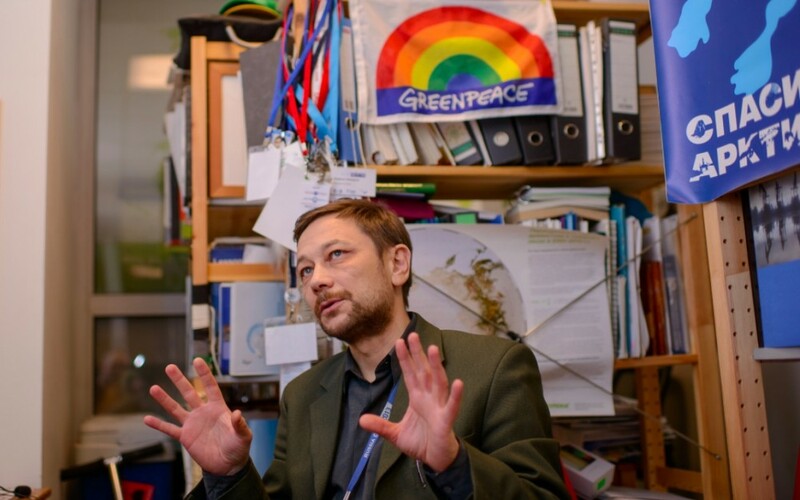 — For some reason the Law on the Arctic is hoping to help solving environmental problems. But this law is about another thing — on the so-called core economic zones. For the Barents Region, this, if I remember correctly, is Vorkuta, Murmansk. But there is nothing new. This is the law on the regular economic support of specific subjects. There is no ecological innovation there. I do not have a clear position on whether a separate law on the Arctic is needed or not. The answer to the question whether such a law is needed depends on what will be written there. If such a law would close some obvious gaps in the current legislation, for example, forbade all-terrain vehicles in the snowless period, single-hulled tankers, steel pipes older than 20 years that can not be exploited because of the risks of oil spillage, drilling in certain forest areas, then such a law would make sense from an environmental point of view. The Arctic law is the law on the regular economic support of specific subjects. There is no ecological innovation there. — Some time ago, Greenpeace collected information from experts and prepared about two dozens of amendments to the legislation on oil production. How many of them have passed? — Let’s remind the readers about the backstory. There was 2014, when we were holding the «Oil Patrol» camp in Komi, in the Usinsk district. We tried to remove oil sludge from one of the barns in order to show that it was expensive to remove oil, and that it was better not to wait for oil spills, but to change pipes. Within the framework of the project, we, together with the Pechora rescue committee [public environmental organization], prepared 24 amendments to the federal legislation and regulatory framework. For example, the proposal to simplify the recording of oil spills in hard-to-reach areas where it is difficult to find witnesses. The most important amendments, from my point of view, are those that are connected with the economic motivation of companies to prevent spills. This is the only thing that makes a company change its internal policy. What did we offer and still offer? First, tougher penalties for concealing information. Introduce a separate penalty for non-compliance with environmental regulations. Secondly, we proposed that the information on the spills was made complete and open, so that the data on each spill including area, volume, coordinates were publicly available. As a rough estimate, oil companies report only the first percent of spilled oil [more detail in an interview with Vladimir Chuprov in 2016]. For today, as of December 2017, three out of more than 20 proposals have been adopted. A proposal was made that the formation water [extracted together with oil and gas from the formation, and then separated] fell into the classification of waste. These are waters that are periodically discharged to the landscape. Sometimes they are scarier than oil, because there are such dangerous toxic substances as chlorides. In nature, they should not exist. They burn everything out. Previously, oil companies had been left out of responsibility for spilling of formation waters, because they were not in the waste classifier. In 2016, they appeared in the classifier. We have achieved that on all offshore projects in the Arctic, in ice conditions, the training of emergency response plans should take place prior to drilling. In legislation until 2014, training could be done three years after the start of drilling. Now, oil companies must conduct drills to eliminate the accident before each new well. This is a useful thing. Another good news that came a few weeks ago and that we have been seeking is an explanation of the Plenum of the Supreme Court on the order of compensation for environmental damage. Let’s say, the oil spill on the Kolva River in Komi in 2013. The company «Rusvietpetro» was supposed to compensate for environmental damage in the amount of 114 million rubles. Not everytning was removed. Of the 114 million rubles, 99 million was written off for the liquidation of the spill: contracts for the collection of oil, inventory. As a result, out of 114 million rubles of environmental damage, only 15 million rubles of «living money» got in the budget. But this means that the company removed about 90% of the oil, which, in my estimation, was not in sight! Our proposal was that for all the oil left in nature, the company must pay with ready money. And the plenum of the Supreme Court recorded this. Two more amendments were supported by the Ministry of Natural Resources, which agreed with our proposals to increase fines for concealing spills and impose penalties for non-compliance with environmental regulations. In addition, the government is considering our proposals for creating an information system in which the company would report for each spill on the oil pipeline. But the story with these amendments lasts, unfortunately, not for the first year. Probably, we treaded on the right corn and got a «normal» reaction. — Are oil companies slowing down the process? — I can not сlaim that. There are oil companies, there is the Russian Union of Industrialists and Entrepreneurs — which is popularly called the Union of Oligarchs, they have good lawyers. They probably follow our proposals, and our proposals are likely to have counter-proposals from Russian Steel, Lukoil, Rosneft, and others. And we can not even imagine what kind of undercover games are taking place there. — How often, when there was an accident, the oil workers did not know what to do? — Quite often. Companies do not have a normal system for eliminating accidents. To eliminate the spill — collect oil on the landscape, and especially when it hit the power grid — is very difficult. Therefore, it often happens that the spill is covered with sand, and as soon as the level of oil content in the soil reaches the permitted level, it is not necessary to liquidate the spill.